Trim out your workspace with Diamond Plate Aluminum Base Molding. All Base Molding feature heavy duty solid metal construction and easy to install. Pre-formed inside and outside corners eliminate miter cuts making installation even easier. Can also be installed onto curved walls - bendable down to 12" radius walls by omitting the kick. Stunning metals make our moldings look like jewelry on the walls. But don't forget about the tough protection that only a metal base molding can offer. Our 4-3/4" size is the most popular since it matches traditional base molding size. Our 2" size is the most economical. Our 6" size is our largest and creates the ultimate showroom effect. Industry standard 1/4" kick covers gap between wall and floor for a beautiful finished appearance. Check out all of the stunning metals and beautiful anodized colors. Durable and rugged. Use for industry, factory, office, retail spaces, workshop, garages, kitchens, tradeshows and more. Looks great, works even better�. Pre-Formed Inside Corners and Outside Corners available eliminating complex miter cutting. Solid Aluminum cuts and drills like traditional trim. Use cutting blade designed for sheet metal. Bendable down to 12' radius walls by omitting the kick. What is the recommend method of adhering the diamond plate to the wall? Does the diamond plate wall base and corner guards carry a warranty? What is the thickness of the Diamond Plate Wall Base molding? 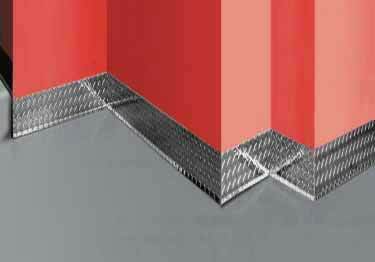 Diamond Plate Base Molding feature heavy duty solid metal construction and are self adhering for easy installation. Pre-formed inside and outside corners eliminate miter cuts making installation even easier. Durable, easy to install and we love the way they look in our garage. Combine these with the diamond plate shelves and wall plates and you're all set. So glad we found them. Thanks Koffler, your products are great!! This product looks great! Well made material and packaged great. My order (although small) was delivered to me in a week and a half. Only issue was with the 8' piece I ordered had a bend near the middle as if someone had dropped it. I used vice grips and some patients and was able to work the bend out. Looks really good! I'm getting a lot of complements on how my "Man Bathroom" looks. I will use this product for my future needs. Wish I could post some pictures. We ordered the diamond plate trim for a home gym. It was perfect! The order took 2 1/2 weeks to arrive and was easy to install! Purchased this for a Shop / car barn we're building. We wanted a product that fit the design and was durable - this fit the bill. Shipping takes a bit of time (couple of weeks) so plan accordingly. At our mission, we have a commercial size kitchen that receives pallets of food donations daily. Our volunteer pallet movers sometimes run into or bump our tile base board. Placing Diamond Plate, outside corners has eliminated the the time consuming need to constantly replace tile to meat health department standards. Sorry we didn't meet your expectations for delivery. However, all our diamond plate products are made to order and normal lead time is 5-7 business days. If you ever need something more quickly, please feel free to contact us and we can see if we can expedite the order. on a tailgate of a truck that had some rust at the bottom. search and this place came up. is a custom piece at the bottom of my truck tailgate. There are other uses for this product and I found one.